The use of sunbeds has been described as "carcinogenic to humans"
LONDON, England (CNN) -- Sunbeds pose a similar cancer risk as cigarettes and asbestos, according to an international cancer research agency. The International Agency for Research on Cancer (IARC) had previously classified sunbeds as being a "probable" cause of cancer. However, the agency is now recommending that tanning machines should be moved to "the highest cancer risk category" and be labeled as "carcinogenic to humans". It followed a review of research that concluded that the risk of melanoma -- the most deadly form of skin cancer -- was increased by 75 percent in people who started using sunbeds regularly before the age of 30. The IARC also says there is evidence of a link between melanoma of the eye and the use of sunbeds. In an article in medical journal The Lancet, WHO oncology expert Dr. Fatiha El Ghissassi wrote: "The use of UV-emitting tanning devices is widespread in many developed countries, especially among young women. "Analysis concluded that the risk of skin melanoma is increased by 75 percent when use of tanning devices starts before 30 years of age. "Studies provide consistent evidence of a positive association between the use of UV-emitting tanning devices and ocular melanoma. "Therefore, the Working Group raised the classification of the use of UV emitting tanning devices to Group 1, 'carcinogenic to humans.'" 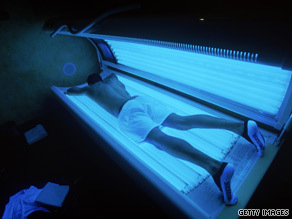 However the UK's Sunbed Association says there is no proven link between using sunbeds and cancer. "We would dispute the IARC classification that sunbeds are "carcinogenic to humans," the organization wrote on its Web site. "The relationship between UV exposure and an increased risk of developing skin cancer is only likely to arise where over-exposure and burning in particular has taken place." Melanoma is the second most common cancer in women aged 20 - 29.5, according to the America Melanoma Foundation. The World Health Organization also estimates that as many as 60,000 people a year worldwide die from too much sun, mostly from malignant skin cancer. Of these deaths, 48,000 are from melanoma, and 12,000 are from other skin cancers. About 90 percent of these cancers are caused by ultraviolet light from the sun.